Pulling off a historic victory, the BJP and its ally Indigenous People`s Front of Tripura together won 43 out of 59 Tripura constituencies. 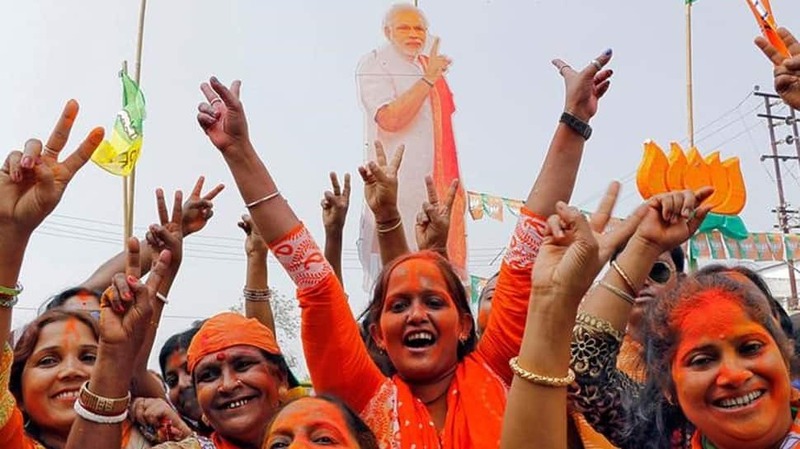 Agartala: The stunning saffron surge in the Northeast on Saturday decimated the Left in Tripura - one of its last two citadels - with the BJP ousting the CPI-M from power after 25 long years. Riding on Saturday`s electoral victory, Prime Minister Narendra Modi and party president Amit Shah told BJP workers that their goal now should be to capture power in Karnataka, Kerala, West Bengal and Odisha. 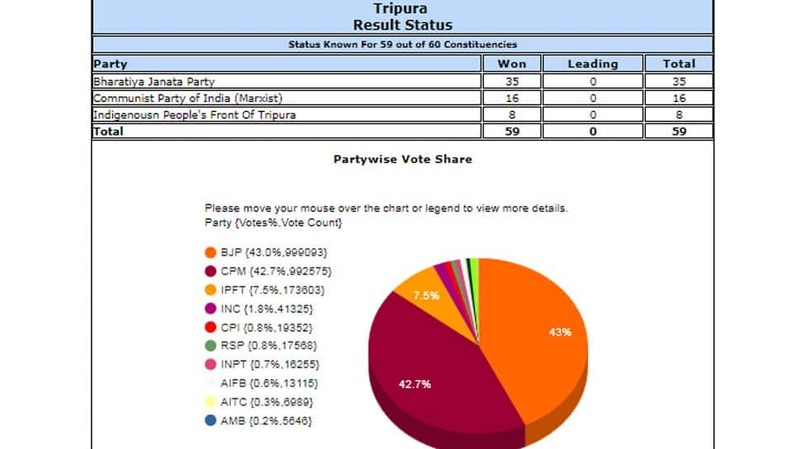 Pulling off a historic victory, the BJP and its ally Indigenous People`s Front of Tripura (IPFT), a tribal-dominated party, together won 43 out of 59 Tripura constituencies. The BJP on its own won 35 seats, four more than the half-way mark, while its ally IPFT won eight seats. In a remarkable performance, the alliance swept all the 20 seats reserved for tribals. The BJP, which had no MLAs in the outgoing Assembly and polled just 1.5 percent votes in the 2013 elections, losing deposits in 49 of the 50 constituencies it contested, secured over 42 percent of votes in the February 18, 2018, Tripura elections. The CPI-M which headed the ruling Left Front was reduced to just 15 seats - down from 50 in the last elections. None of its partners, including the CPI, Forward Bloc and Revolutionary Socialist Party, could open their account. The Congress, which had 10 members in the outgoing assembly, drew a blank this time. BJP-IPFT combine wins majority in Tripura by securing 30 seats. Alliance ahead in 13 other seats, says EC. Among the Left Front`s leading candidates were Health and PWD Minister Badal Choudhury (Hrishamukh), Education Minister Tapan Chakraborty (Chandipur), Information, Food and Civil Supplies Minister Bhanulal Saha (Bishalgarh), Sports and Youth Affairs Minister Sahid Chowdhury, Assembly Speaker Ramendra Chandra Debbarma and Jail Minister Manindra Reang. IPFT`s leading candidates included Narendra Chandra Debbarma (Takarjala), Mevar Kumar Jamatia (Asharambari) and Prashanta Debbarma (Ramchandraghat). In Dhanpur constituency, CPM Manik Sarkar is still leading with 2224 votes. BJP candidate PRATIMA BHOUMIK is trailing. CPM candidate SAHID CHOUDHURI is leading from Boxanagar seat with 4167 seats. In latest Tripura Election Trends, BJP is ahead in 37 seats, CPM in 22. Chief Minister Manik Sarkar still leading from Dhanpur constituency. BJP state president Biplab Kumar Deb and party MLA Sudip Roy Burman leading in their respective seats of Banamlipur and Agartala. The gap between CPM and BJP is now widening, with the later surging ahead. BJP bounces back with a lead in 32 seats. CPM, which is giving a tough fight to BJP, is close behind. Manik Sarkar is leading with a margin of 1682 votes. "Trends are encouraging, I am hopeful and confident that BJP will form the Govt in Tripura," said BJP leader Himanta Biswa Sarma on Tripura poll results. CPI(M)'s Moboshar Ali leads in Kailasahar, Tripura. As per official Election Commission results, Bharatiya Janata Party is leading in 5 seats, Communist Party of India (Marxist) in 9 and People's Front Of Tripura in 2 seats. "Seeing the earlier trends: I feel that in Tripura BJP is going to do very well In Nagaland too, our alliance is doing very well and Congress is trailing in Meghalaya. The three results of North East are going to be very good for BJP" says BJP leader Ram Madhav. In Tripura, CPM is leading on 24 seats, BJP in 22 while Congress is ahead in just 3 seats. Manindra Reang, Minister for Tribal Welfare (TRP & PTG), Home (Jail) and GA(Printing and Stationary) in the outgoing Manik Sarkar government, is leading in Santirbazar assembly seat in South Tripura district. Tripura chief minister Manik Sarkar is leading from his seat in Dhanpur. Border Security Force (BSF) personnel have been deployed along the India-Bangladesh border. Furthermore, the state police, paramilitary forces and Tripura State Rifles are on vigil across the state in a bid to ensure smooth counting of votes. "Adequate security arrangements have been made in the 20 places where counting is taking place. We have deputed senior officers of the police for overseeing arrangements. Measures have been taken for the safety and security of the candidates. The BSF has been alerted, and they will continue their vigil along the border. We would like to appeal to all to maintain peace and calm," Tripura Chief Electoral Officer, Sriram Taranikanti, told ANI. Tripura is witnessing a close fight. BJP is currently leading in 13 seats, CPM in 12. It's neck-to-neck to contest between BJP and Tripura.